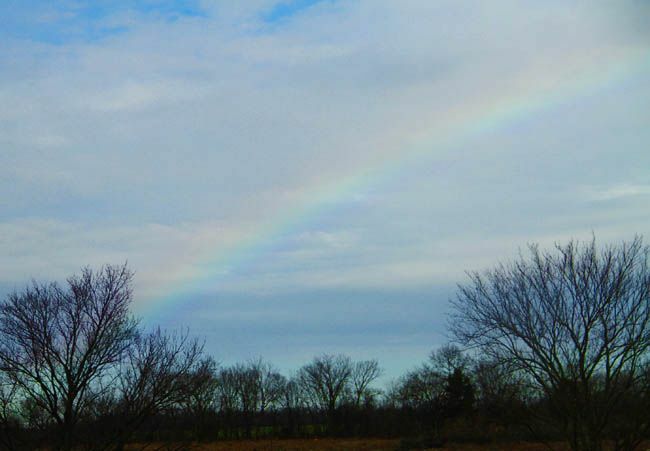 Driving across Kansas the other day, in the middle of December, with no rain in site, I looked out my car window and noticed a huge rainbow. If colors and scenes can be this beautiful on earth, I can only imagine what heaven will look like. Rainbows everywhere? Warm yellow light? Gold sparkles? :) Yep, I believe so. It's so beautiful! What does it mean?! Oh, wait, no. It's not a double rainbow. I posted mine yesterday thinking it was Friday! Such a beautiful rainbow, and what an unexpected gift on a sunny day! God is awesome! Happy New Year!